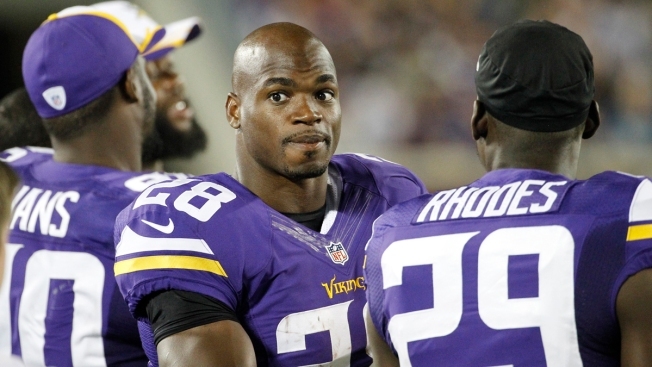 Adrian Peterson "Anxious to Start a New Chapter"
Minnesota Vikings running back Adrian Peterson is in New York City to meet with NFL Commissioner Roger Goodell about his reinstatement, and while there, he made clear he was ready for a new start. “I am anxious to start a new chapter and get on with the rest of my life,” Peterson told ESPN’s Josina Anderson, via ProFootballTalk.com. Granted, Peterson didn’t go as far as to say that he intends to start this new chapter somewhere other than Minnesota. But with all the reports suggesting that Peterson doesn’t want to play for the Vikings anymore--and there have been quite a few--we feel confident in saying a lot will be read into this comment. This is especially true in Dallas, where Peterson has remained a talking point all offseason and where the rumor mill started working overtime last week when Tony Romo restructured his deal to clear almost $13 million in cap space, a move that some took as a sign that the Cowboys are gearing up to make a run at the six-time Pro Bowler.